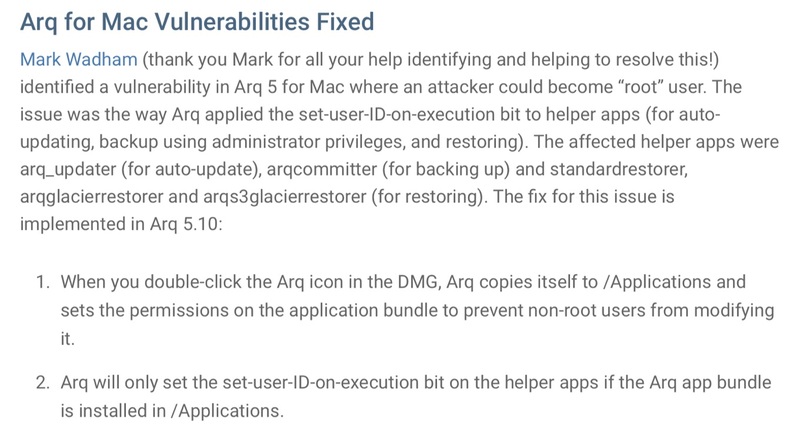 macOS High SierraとArq Backupの不具合を利用し、非rootユーザーがroot権限へ昇格出来る脆弱性の詳細が公開される。 | AAPL Ch. Last year I found a couple more privilege escalation vectors in Arq Backup for Mac version 5.10. Both have now been fixed in the latest release. It turns out that if a file appears at this path, even if it isn’t root-owned, it will be immediately processed by the cron system and any commands within will be executed as root (this oversight was reported to Apple).